On International Workers’ Day, the International League of Peoples’ Struggle gives its clenched-fist salute to the workers of the world and their genuine unions and labor organizations. We applaud their struggle for higher wages, job security and free exercise of trade-union rights as well as their democratic struggle against imperialism and its reactionary allies the world over. We remember and celebrate the workers’ heroic struggle for an eight-hour workday in 1886. Prior to 1886, the bourgeoisie sought to intensify the exploitation of workers by making them work for 10, 12 or even 16 hours long. As the strain of inhumanly long working hours became more unbearable and as the living conditions of the working class worsened, the demand for a significant reduction of hours became more pronounced. The workers emerged victorious after many huge protests and after many workers sacrificed their lives. This is proof that the bourgeoisie will always resist workers’ demands and that workers must wage fierce battles in order to win their rights. Throughout the history of the militant workers movement, workers of the world have achieved many victories in advancing their rights and interests. Through various forms of mass actions, oftentimes met with brutal repression by the state and big capitalist firms, they have won for respect for their rights, obtained social benefits and pressured governments to codify these rights and benefits in laws and conventions. These hard-won victories of the workers of the world and the labor movement are facing renewed attacks from the state and capital. Neoliberal policies implemented since the late 70s and early 80s have pressed down workers’ wages through various means in order to allow monopoly capitalists to rake in huge and increasing profits despite the intensification of the crisis of overproduction endemic to the world capitalist system. The global economic and financial crisis that broke out 2007- 2008 was the result of neoliberal policy with its concomitants of wage reduction and social cutbacks, low taxe rates for the corporations and wealthy, investment and trade liberalization, privatization of public assets, deregulation of social and environmental restrictions and denationalization of underdeveloped economies. Instead of recognizing the cause and consequences, the bourgeoisie has used the crisis as an opportunity to further concentrate wealth and resources into the hands of monopoly capitalists. Currently, US imperialism and the transnational corporations are actively pushing new free trade agreements that openly disregard international labor rights conventions, while ensuring greater incentives, privileges and protection for capitalists. The new trade agreements will drive a race to the bottom as governments adopt austerity measures at the expense of the working people, cutting down wages, eliminating job security through labour flexibilization and short-term contracts, attacking workers rights to unionize and strike and undermining the bargaining power of workers’ unions in the name of competition and attracting investments. In response to this situation, the workers and peoples of the world have been waging various forms of collective action and militant struggle. In Greece, Spain and other countries in Europe, workers and people are taking a stand and voting against austerity measures imposed by the troika of European Commission, the European Central Bank and the International Monetary Fund. The strikes mounted locally and across Europe between 2012 to 2015 are some of the biggest since neoliberal policies were introduced. In the US, the Occupy protests exposed the gross inequality between the 99 per cent people and 1 per cent oligarchy and the crimes of the financial oligarchs responsible for the global economic and financial crisis that broke out in 2007-2008. Of late, protests are centering on the racist violence inflicted by the police against African-Americans. Low-wage workers in McDonald’s and Walmart are also intensifying their protests for an increase in wages which have been stagnant since the 1970s. The workers and peoples in various Arab countries have overthrown openly authoritarian governments. The strikes of the workers of countries like Egypt have proven to be one of the key factors in the Arab Spring. Unfortunately the absence of genuine communist and workers’ parties outside of the revisionist mould has resulted in the re-ascendant conflict of Islamic reactionaries and bourgeois military cliques. The US, the NATO and Israel have also taken the opportunity to bring down the Qaddafi government, unleash counterrevolution in Syria and fielded the Islamic state to wreak havoc in both Iraq and Syria. 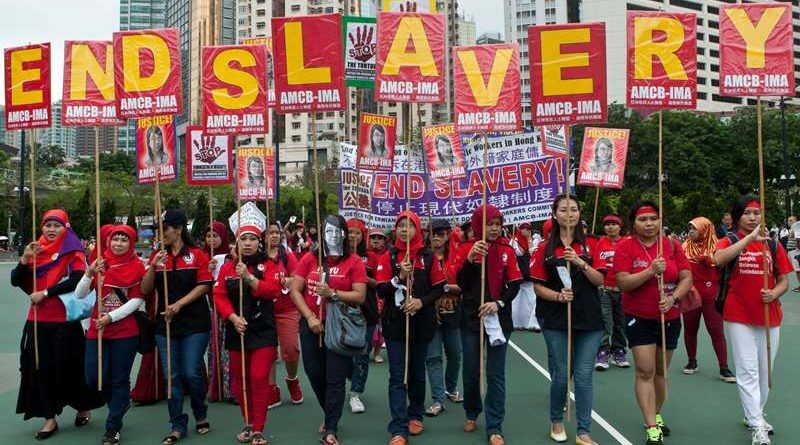 The workers and peoples of Asian countries have shown their renewed vigor for mass action. Cambodian workers successfully mounted nationwide strikes and high-impact campaigns centered on wages. They are paving the way to the creation of a broad people’s movement. Workers in the Philippines and Indonesia have also held various protests for higher wages and against contractual employment. In 2014 and this year, workers of South Korea launched several strikes aimed at the Park Geun-hye government which wants to railroad retrogressive labor market reforms and is launching a crackdown against trade unions and activists. For years, there have been many spontaneous workers’ strikes in China. In the last seven years, the number of strikes has further increased and their demands are taking on a more political character against the monopoly capitalist state masquerading as socialist and the ruling party which is actually a phoney communist party. The miners of South Africa launched militant protests for higher wages and better working conditions. Despite the massacre inflicted on them by the government, they remain undaunted and continue to struggle for workers’ rights. The workers and people of South America continue to support governments that are critical of the US and provide ramparts to the all-out implementation of neoliberal economic policies in the region. In view of all the foregoing, we call on the workers of the world to further intensify their struggle for higher wages, job security, and the free exercise of their trade-union rights. We call on them to intensify the democratic struggle against imperialism and reaction which are behind the vicious and worsening attacks on workers’ rights. We call on the workers of the world to fight for higher wages, which have been pressed down and have been lagging behind the increase in the cost of living. They should struggle for job security, which has been eroded for decades and is being destroyed at a rapid rate by the big capitalists. They should unite and fight, build more and stronger unions, and defend existing unions against capitalists’ attempts to destroy these either through frontal attacks or cooptation. They should unmask the lie that higher wages and improvements in working and living conditions of workers go against generating employment. They should do away with the obscene lie that gains of the working people of the world, who create social wealth, are the ones responsible for the crisis, and that the monopoly capitalists who promote plunder and war are the ones who generate economic growth. We call on the workers and peoples of the world to firm up their unity and advance their struggle for democratic rights and for better working and living conditions against the escalating exploitation and oppression being inflicted on them by the world capitalist system. They should struggle against worsening imperialist plunder and war. Most important of all, they must heighten their consciousness and organized strength to fight and defeat the global and national systems of exploitation and oppression as well as the grave damage done to the environment by monopoly capítalism. They must fight for a new and better world in which the working class can fulfill its historic mission of building socialism. They must fight for a society in which the conditions of greater freedom, democracy, social justice, development, cultural progress, peace and international solidarity can be realized.